Sol LeWitt: Wall Drawing 731A (Detail). Color ink wash, 305 x 790 cm. Second Drawn: Hidemi Nomura and Michael Benjamin Vedder. Installation: 128 Rivington Street, New York, NY, 2014. 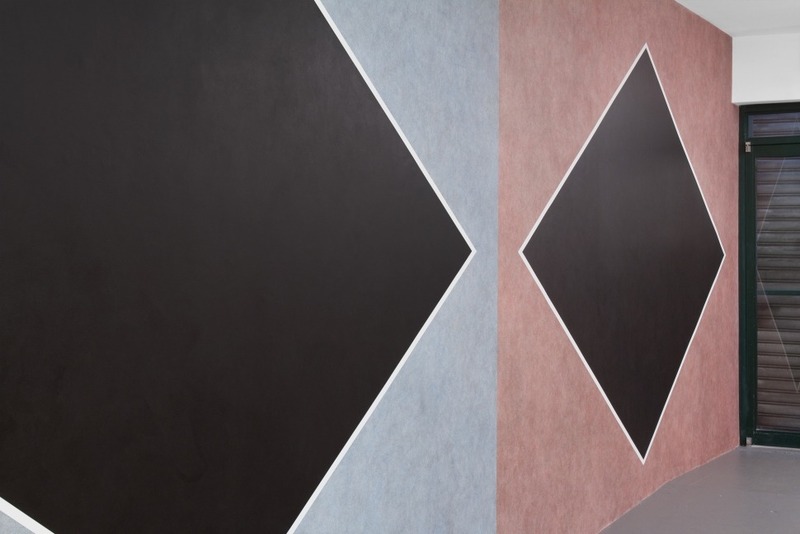 Sol LeWitt: Wall Drawing 731B (Detail). Color ink wash, 305 x 705 cm. Second Drawn: Hidemi Nomura and Michael Benjamin Vedder. Installation: 128 Rivington Street, New York, NY, 2014. 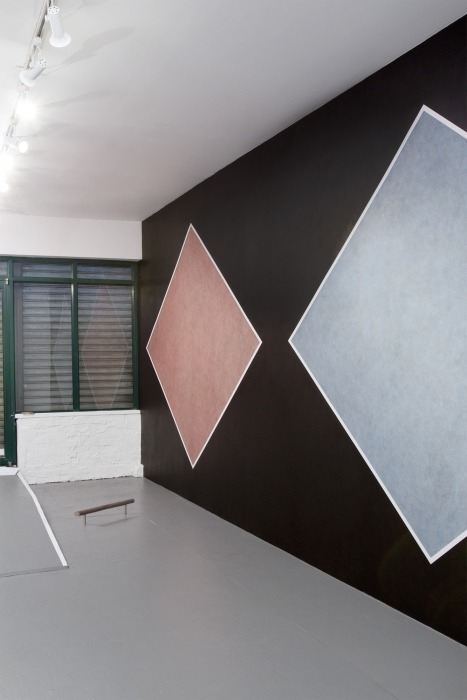 In July, 1993, GALLERY ONETWENTYEIGHT presented Sol LeWitt’s Wall Drawing 731 as part of the gallery’s exhibition program. Now, twenty one years after its first and only installation, EXILE and GALLERY ONETWENTYEIGHT collaborate to once again install this particular Wall Drawing in its original space. 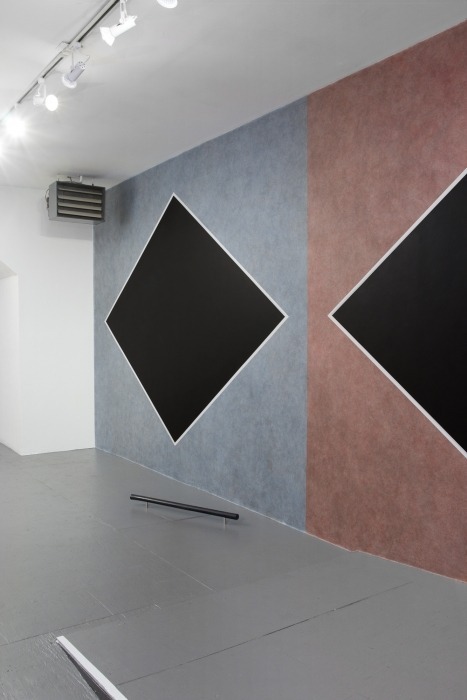 Wall Drawing 731 consists of three individual parts: A, B, and C. 731 A (two black diamond shapes with white bands on blue and red ink-washed split wall) and B (one blue and one red ink-washed diamond shape with white band on black wall) are installed on opposing walls in the front room of the gallery and, through their symmetry and color scheme, form a visual dialogue with each other. Part C (red ink wash diamond shape with white band on yellow wall) ruptures this symmetry with its singular location on an irregularly shaped wall adjacent to Part B and it’s newly introduced yellow color. Intentional to the site at 128 Rivington Street the work, through its combination of color and distinct shapes, seems to recall the time of it’s creation by LeWitt in the early 1990s. From today’s perspective Wall Drawing 731 retains aesthetics synonymous with styles of the time with its unusual and non-conforming color combination, the dialectical opposition of parts A and B and the surprising insertion of part C.
The re-installation of LeWitt’s Wall Drawing 731 in its original and architecturally almost unchanged location presents an exceptional opportunity to re-evaluate the piece within an otherwise completely different cultural, architectural, social, as well as art-historical sphere. 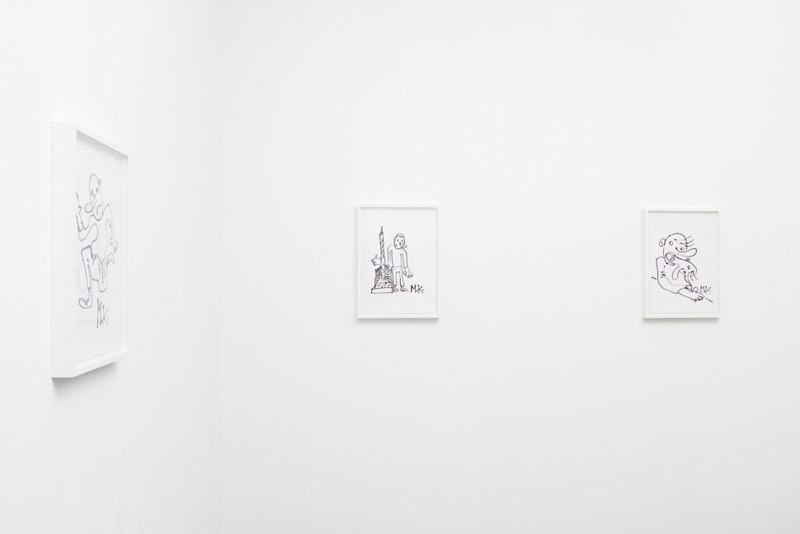 The two versions of the drawings, both in 1993 and now in 2014, if to be understood in their material sense as two thin layers of paint, can be seen as a beginning and an end in which twenty one years of history are encapsulated. But the exhibition’s cyclical reappearance is in fact a lure. While the conceptual source of the work remains unchanged, its re-execution is always unique due to a constantly shifting set of variables. When imagining the two drawings, of Wall Drawing 731, as if they are transparently one on top of the other, for example, in form of their photographic reproductions, their subtle differences would become evident. These differences represent the identity of the drafts people who execute the work, as well as the subtlety of LeWitt’s thought and artistic process. Each viewer is invited to approach the exhibition on a cultural, personal, as well as social level reflecting upon myriads of changes that have occurred since the first drawing of the original work in 1993. Repetition becomes a strategy for reflection upon continuity and change. The five insertions by Martin Kohout create complexity beyond simple historical reconstruction. 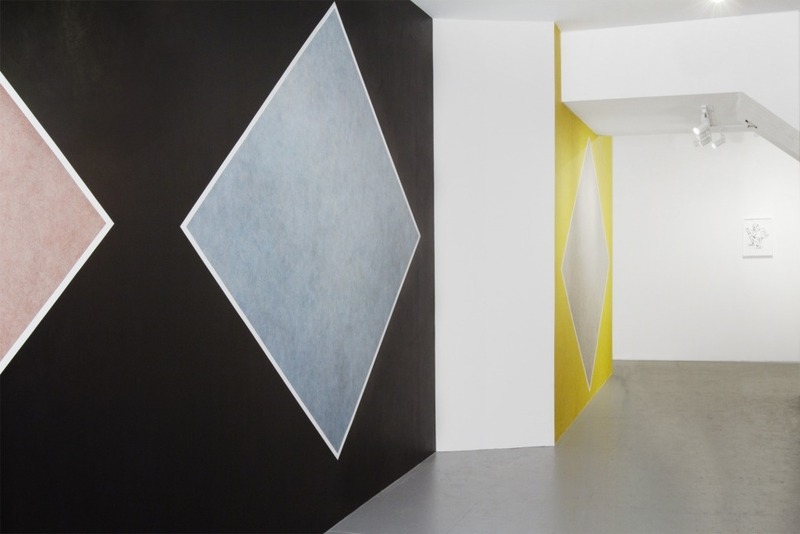 While referencing the work of LeWitt, Kohout’s insertions provide a kind of quiet irritation – the artist’s personal response and contemporary interpretation to the work on display and the process of Lewitt. 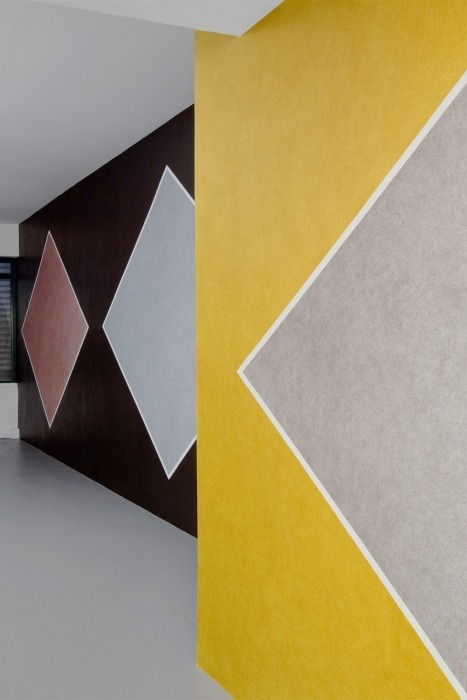 This project has been made possible in collaboration with the Estate of Sol LeWitt. Wall Drawing 731: A diamond with color ink washes superimposed, within a 1″ (2.5 cm) white band.